Nearly two seasons in the bag here on The Final Wager and I can’t believe people are still messing up. If Elsa doubles her score, she’ll have 28,400. 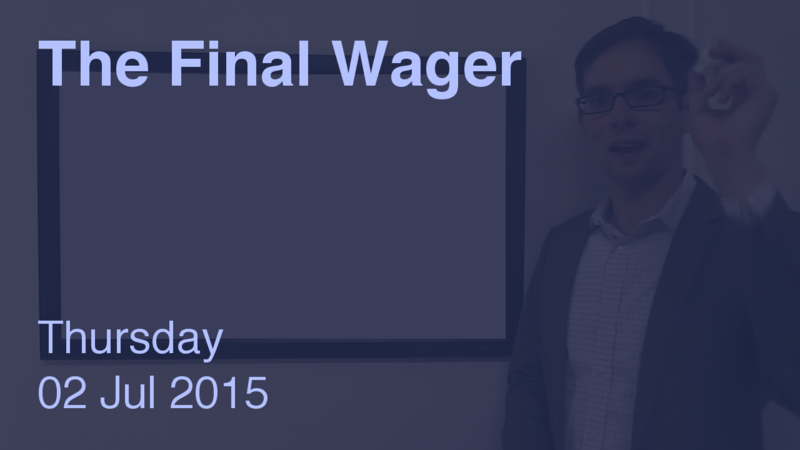 To cover this all-in wager, Alex will need to wager 12,000. To stay above his total, Elsa can wager up to 9,800. Jon can wager up to 3,400. A successful doubling will put Jon at 15,600. To cover this, Elsa should wager at least 1,400. Alex could wager at most 800. Jon would need to wager at least 5,000. All in! All in! Elsa might also consider 3,000 to cover that 800 wager by Alex. If Elsa makes the rational maximum wager of 9,800, Alex will need to wager 7,600 to cover her. To stay above him, Elsa can wager up to 5,400. Jon might consider risking at least 1,000. No, no, no, Elsa! We were so close to having a good evening, too.